Marfy 3784 is a dress with a v-shaped neckline with tucks, a twisted front bodice detail, 3/4 length sleeves, and a four-section, knee-length flared skirt that’s about 25″ from waist to hem. It isn’t clear from the fashion illustration, but the front twist detail is an overlay rather than something that’s sewn directly to the skirt. The fashion illustration is slightly incorrect in that it doesn’t show how the tucks in the front actually extend to create a collar in the back. This is unusual for Marfy – when it comes to showing detail, normally their fashion drawings are spot-on. Marfy suggests “jersey” or “crepe” for this dress. More often than not, when Marfy lists “jersey” as a fabric suggestion you’ll get the best fit and highest comfort level if you use a stretch woven or stable 2-way stretch knit. (Think silk jersey or ponte rather than a rayon/lycra jersey.) I’ve compared the back bodices of Marfy patterns in my collection that listed “jersey” as a fabric suggestion (like this one) to patterns that listed something like linen (Marfy 3879). The ones that suggested jersey were definitely cut slimmer. If Marfy doesn’t list a fabric recommendation, most of the time you’ll be fine using a non-stretch woven. But if the style is slim and they list jersey as a recommended fabric, take that suggestion seriously. I have a pretty narrow back waist and didn’t need to take in the back on this dress at all. And I am always taking in the back waist of my garments! So for the bodice on this dress you want to use something that’s thin with two “good” sides and a fairly firm stretch. I suggest using silk jersey, a thin wool knit, or a lightweight ITY. (If you’re self-conscious about your back view, just underline the back with something like a lightweight stretch mesh or powernet.) The skirt is much more forgiving – anything that drapes well on the bias will work. For the bodice and sleeves I used a burgundy silk knit purchased from Fashion Fabrics Club nearly four years ago. 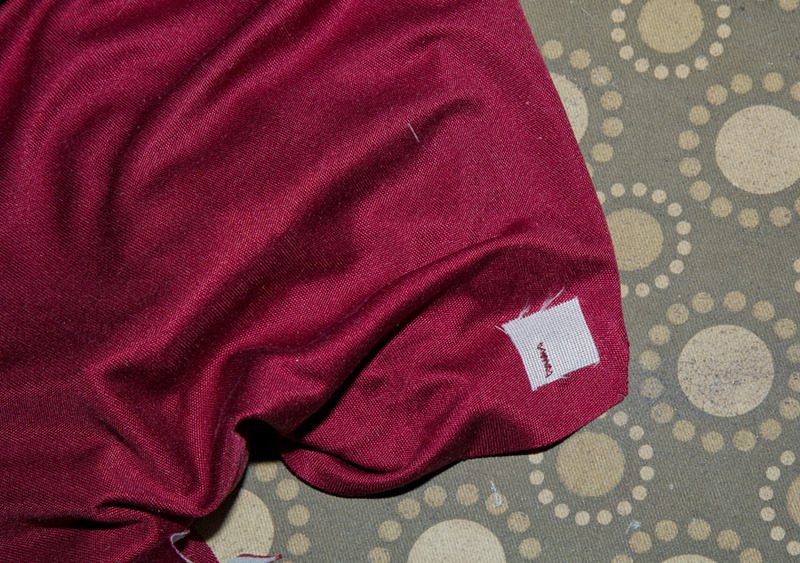 (I’ve noticed the silk jersey fabrics back then were a little thicker than what I’ve been able to get more recently.) I needed about 1.5 yards of this fabric. For the skirt I used an eggplant Italian wool gabardine, purchased from Emma One Sock around 3.5 years ago. I had 1.75 yards of this fabric, and found that yardage amount let me lay out the pieces comfortably, without having excessive fabric left over. You can see that I was going for an analogous color scheme. I’m trying to push myself a little more this year when it comes to color blocking and combining different fabrics. I interfaced the neck facing with the lightweight Pro-Sheer Elegance from Fashion Sewing Supply. When I made the interfacing pieces for the neck facing I extended the interfacing 1/2″ beyond the fold line, just like you would for a jacket hem. 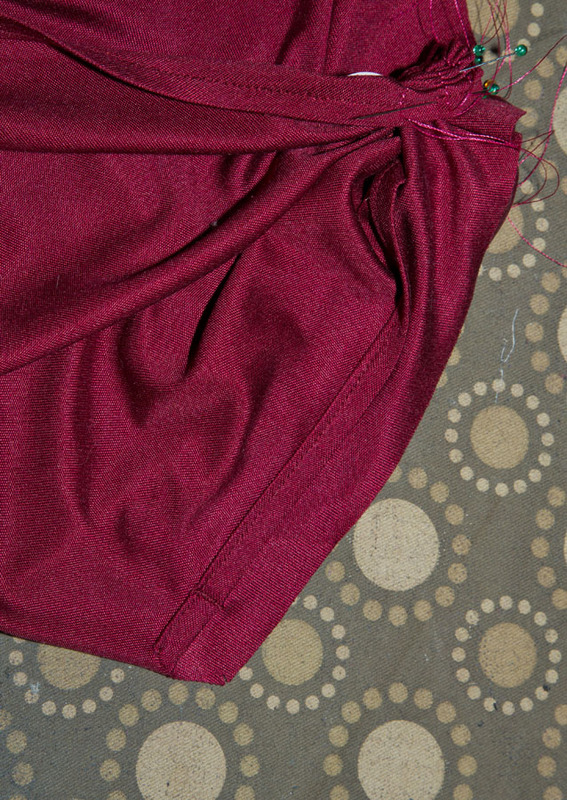 I also interfaced the center back seam where the invisible zipper is inserted with Pro-Sheer Elegance. I did not line this dress. The bodice can’t be lined due to the twist detail in the front. Adding a skirt lining – at least by machine – would have been very challenging due to the way the front bodice attaches to the front skirt. Underlining the skirt isn’t a good idea either, because an underlining will interfere with the drape of the bias. Lengthened sleeves 3/4″ between shoulder and elbow and another 3/4″ between elbow and wrist, for a total of 1.5″. After I tried on the dress I realized it was unnecessary, and ended up removing all of this extra length. I also think they are a little wide, and I may go back and narrow them. Added a total of 2″ to the hips (measured at the hip notch). This resulted in the skirt being about 8″ fuller at the hem. I wish I had lengthened the bodice 1/2″, as the proportions are just a tad higher than I wanted. I thought the jersey would be pulled down more by the weight of the skirt, but it wasn’t as significant as I anticipated. The construction of this dress was more challenging than that of my last Marfy dress. There’s a couple of things you have going on here: the front twist (obvious) and also the tucked neck detail (not so obvious). The front twist detail is a little different from the Jalie twist top in that it is actually forms an overlay. It is really good in that unlike the Jalie top there’s no “peeking” around the twist detail…but it does make construction more complicated. Which, of course, is par for the course when it comes to most Marfy patterns. First I transferred the letters on the pattern to the fabric by using those little 3/4″ “dot” stickers. I sewed the front bodices together at the center front, from the facing to the notch marked on the pattern. Then I pressed the seam allowances apart. Next you’re going to want to finish off the seam between D and O, and K to the center front. I did a narrow double-folded hem so that it would still be attractive if the wrong side happened to flip up during wear. I gathered up the seam between K and O. Then I folded over the bodice so the gathered section O met the side seam O. The pattern says to “buttonhole” at a marking about 3/4″ away from D. What this means is you need to tack down that seam at this position. I used a small, narrow zigzag stitch. You can also see how I stabilized this section with a scrap bit of interfacing. Now I had a loop to pull the gathered K-O of the opposite side of the bodice through. 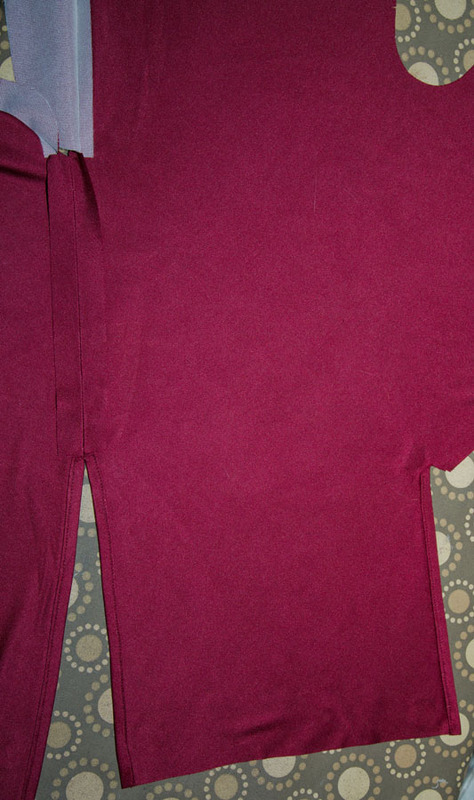 After I pulled the gathered section through, I pinned it to the side seam, matching up O with O. Then I tacked the section marked “buttonhole” on the other side. Finally I attached the front bodice to the front skirt. 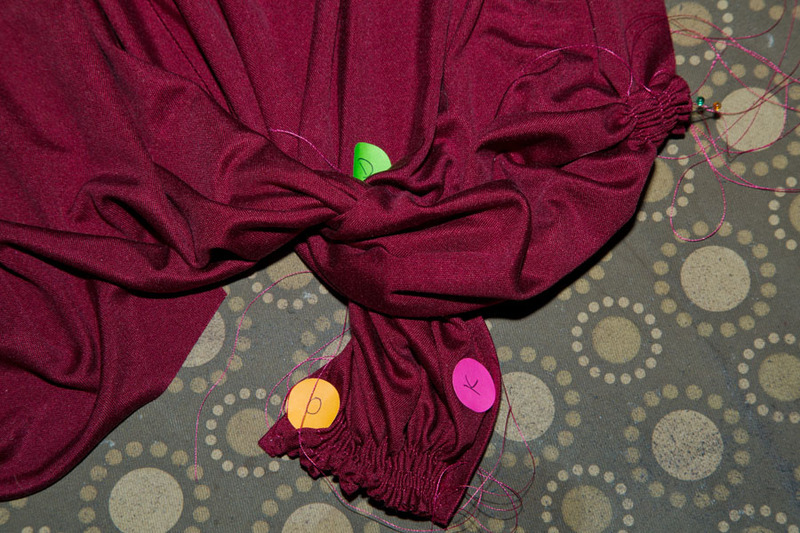 I started sewing from each side seam and ended at the center front. The second pass was more difficult; the knot is in that section, and it is hard getting the sewing machine presser foot close enough to make the seam allowance the correct width. The nice thing is the knot will covers up any slightly imperfect finish :). The neckline tucks are a little difficult not so much in concept as execution. First you sew and those tucks as marked on the pattern. (This is the easy part.) Then you sew the front and back bodices together at the shoulder seam, then turn and pivot to continue sewing the back bodice neckline to the front bodice collar detail. It is very similar to how the Style Arc Abby cardigan is constructed, only on this Marfy pattern you have the bulk of those tucks making things more challenging. Aside from those two steps the dress is pretty easy. My one irritation is that the facing doesn’t stay in place very well. It looks like I will need to tack it down in place by hand to the shoulder and back neck seams. The catalog this year has 10 free patterns. I always suggest people buy a catalog if they want to test out Marfy. You can also buy some of the patterns now as PDF downloads. The one thing about Marfy is that I find their patterns are pickier than most when it comes to choosing the right fabric. The dress is gorgeous, and your photos are just beautiful. I really like the colour combination – it is a nice change. Terrific review, as always. Thanks Lara! Red and purple have always been one of my favorite pairings…a little unusual, but still harmonious. Gorgeous dress and it looks spectacular on you. The color combination is especially pretty and is great with your coloring. This is beautiful! I thought your previous Marfy dress this year was beautiful, but then you post this one and… wow! These patterns are pricy…gotta put them to use! Love your posts, so detailed and informative. Great job! Thanks Lisa…I do my best! This dress is perfection on you, in shape and in color. Wonderful work, and thank you for the detailed explanation. Thanks, Marta. Can’t always be gray and blah during the winter, right? And if I make this again I will have a reference for what to do! It is a beautiful dress and suits you well. I like the analogous color scheme. What a surprise it must have been to see that collar on the back of the neck! I like it better this way. It is fortunate that I’ve made other styles with a collar like that, otherwise I think it would have really thrown me. Gorgeous dress and the fit is spot on. Did you make a muslin first for the dress or are these your usual alterations for Marfy patterns? No muslin. I compared the pattern pieces to other pattern pieces I knew fit well. Very striking color combination. The neckiine and the twist overlay are classy details. In regard to personal fitting, I recently have come to understand I require a forward shoulder adjustment. 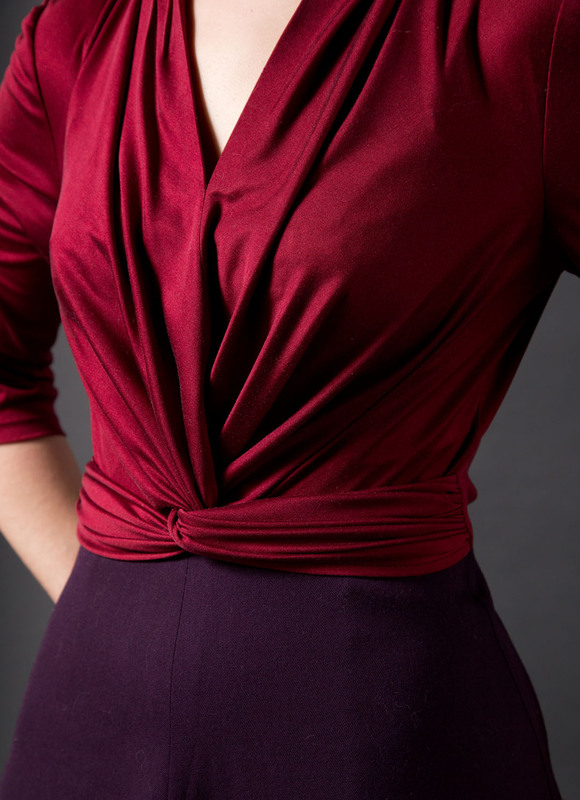 I have noticed bloggers state this kind of adjustment at “3/8” or perhaps “1/2”, but it seems on me patterns line nicely at the neckline the only forwarding needed is at the shoulder? Is this correct? Or am I possibly looking at a rounded back adjustment in combo with the forward shoulder? In my most recent makes, moving the shoulder forward the same amount at the neck and shoulder has resulted in the shoulder line being “off” at the neck for me. 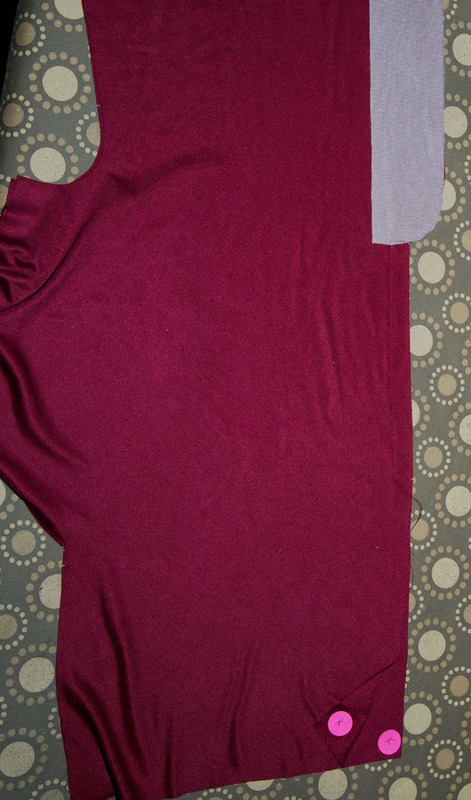 I do also alter the sleeve cap accordingly, but notice you do both rounded back and forward shoulder adjustment. Would you suggest I consider doing the same? Thanks for taking the time to read this and for your reply if possible. I love the detail you provide about steps involved in constructing garments!! You don’t move the entire shoulder seam. Instead you pivot it from the neckline. When you’re done the back shoulder seam is more square than originally drafted, and the front shoulder seam more sloped. I alter the sleeve to match by slashing it around an inch or so below the crown of the cap, then slide it forward the same amount of my forward shoulder alteration. When I’m done truing the seam of the sleeve cap the back is more sloped, and the front is steeper. Only you can determine whether you need a founded back alteration or not. The rounded back alteration is somewhat misunderstood. It isn’t always from age or bad posture. Some people are just born with more naturally rounded backs, and surprisingly people with a lot of muscle tone in their upper back (like young men that do weightlifting) might need one. In my case I’ve always had prominent shoulder blades. They are the reason why I always add back shoulder darts, and the reason why I need to do a rounded back alteration. It is similar to how women with a prominent bust add length at the center front of a bodice in the form of a full bust alteration. By doing the rounded back alteration the back neckline sits where it needs to be, and back armholes don’t pinch into my armpits. This is an amazingly constructed garment and looks so beautiful on you. Or should I say you look beautiful in it. You have done a super job on a complex pattern and the style suits you perfectly. I love reading your reviews because they are so thorough and interesting I think I’ve read most of them and somewhat take them for granted, it’s time I said thank you. So thanks Anne I really appreciate the time you put into your blog. Your reply above re fitting the shoulder and back is timely for me as I am struggling with that concept at the moment, it always confounds me. Thanks! I know there’s a bunch of people subscribed that never leave comments. I sometimes wonder what they get out of following me! Very nice dress! Unusual combination of colors but it looks great! Nice, nice, nice,, I like it…. I at first thought this was separates but how fascinating that it is a dress…and a beautiful one at that. Love the colors. The bodice is gorgeous. This dress shows your superb hand and it fits you perfectly. Wow! Thanks for the in depth reply. I really appreciate the guidance. 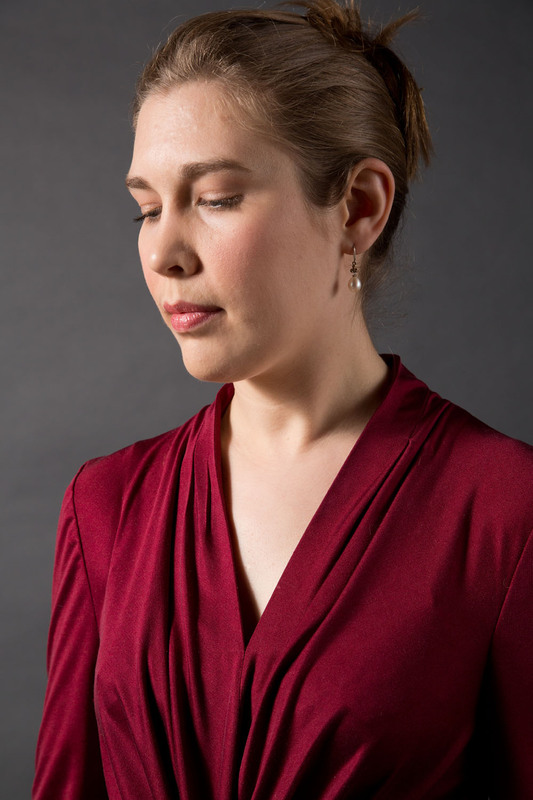 The tutorial I used for forward shoulder adjustment did not mention pivoting from the neck, and the book resources I currently own did not cover this either. Based upon your reply, I think it is time for me to try a rounded back adjustment as well since the “tight armhole” at the back is sometimes an issue for me. Please let me reiterate thanks for your elaboration about this. I have learned much because of the time you’ve invested in sharing details and fabric tips! The biggest indication that someone would need a forward shoulder alteration is that the shoulder seam is not entirely centered. 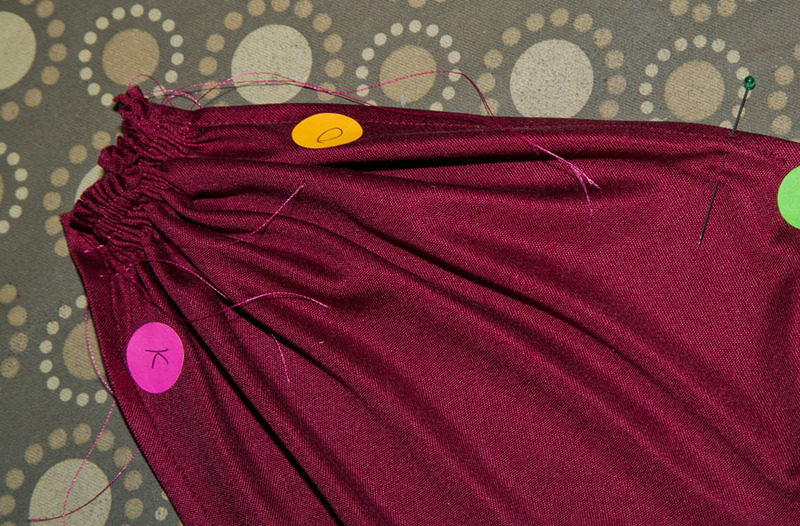 It starts off centered at the neck, then angles toward the back as you get to the armhole. That’s why you use the neck edge as a pivot point. 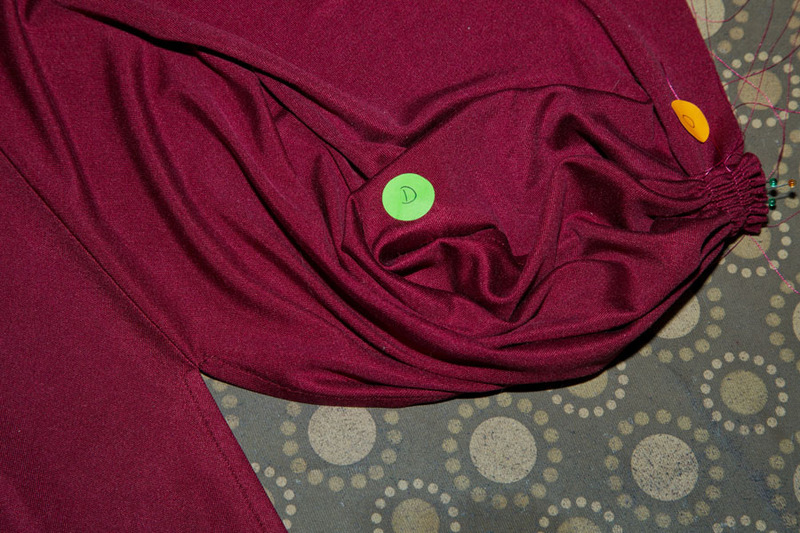 If you didn’t need one the shoulder seam would be a straight line from your ear to the top of the sleeve cap. Ah, ok, thanks for the explanation. That is a good idea. Everything about this dress is just perfect…the colour combination, the fit, the style, the sewing. You look absolutely amazing in it. Whoa! That is one beautiful dress – you did an amazing job putting it together and it looks fab on you! Your sewing skills just keep getting better and better. I have only recently found your Website and found you such an inspiration to get back to sewing. 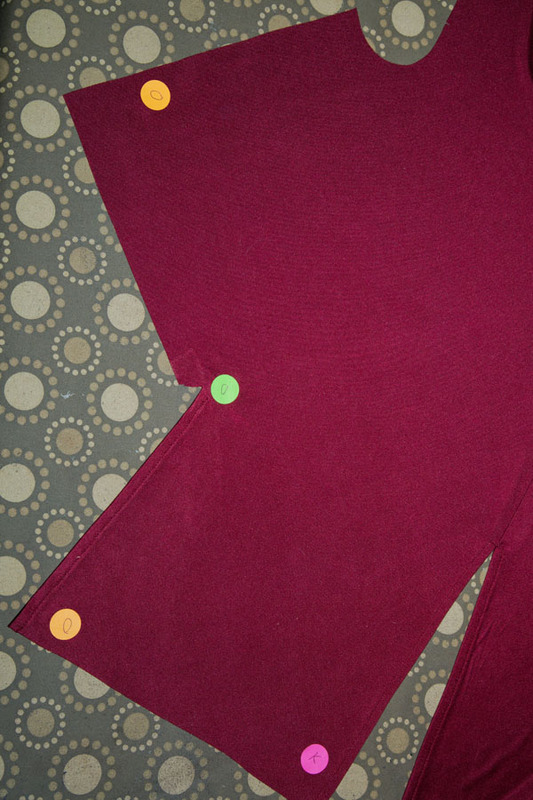 Have purchased and sewn 3 style arc paterns encouraged by your blog ,thank you its been fun sewing my own clothes again . Would love to work out how to better adjust patterns to fit as well as yours do.